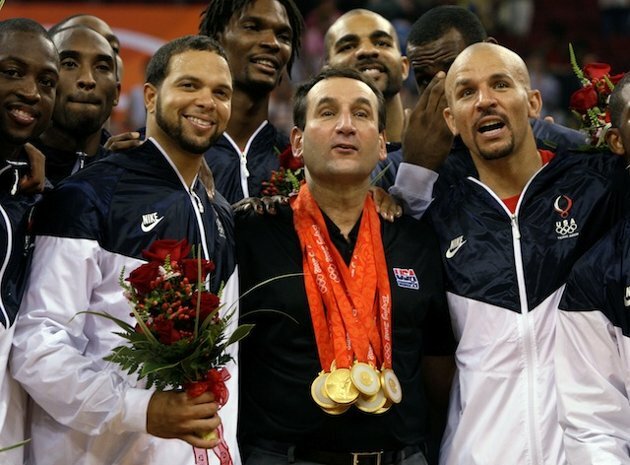 This morning Team USA wrapped up their second consecutive Gold Medal in Men’s Basketball under the leadership of Coach K*. But unlike his incredible Duke teams, this team is not made up of amateurs who are hustling to earn a spot in the pros. No, this team is made up of professionals. And not just any professionals; these are the very best players in the World. These are pampered superstars who can have every wish catered to by appreciative owners and adoring fans. Men who don’t even really have to the listen to their Coach, because they can get their coach fired. So how does Coach K do it? How does he make these twelve superlative individuals work together as a team? Do we really think, that they could do it without him? Is he just a figurehead that allows them to check the box “Head Coach” on their entry form? I would say not, just look at the USA Basketball team in 2004 where the United States lost to Argentina. It’s not a forgone conclusion that as long as you fill the roster with NBA players that they will win. Enter Coach K in 2006, and the USA has never looked back. In 2008 the US looked like a TEAM again and in 2012 they were incredible. But did you know that despite the importance of a Coach in basketball, the coach does not win a medal if the team does? Which means that after Coach K won in 2008, he came back even when he knew he would not get a medal that properly acknowledged his contribution to the effort. The old West Point graduate instead is satisfied knowing that he filled the role the team and perhaps the country needed him to fill. Coach K exemplifies the idea that as leaders we can be called on to fill a role that provides guidance to our teams to help them excel but not to take up room in the spotlight. After all they were the ones “on the floor”. We should be satisfied that we got to work with champions. * = I understand that simply mentioning Coach K in Raleigh brings strong feelings of hate from NC State and North Carolina fans. You should read on anyway. So a couple of months ago I attended a conference where a Disney trainer shared their secrets or rules for brainstorming sessions. I used them several time already and have had a couple of employees ask me for them so they could use them in their meetings. I thought I would share them here for everyone and document them for my own future reference. 1. No Boundaries – Nothing is too far a field of “off subject”. Go with it and see where you end up! 2. Be Positive – Nothing will sour a brainstorming session faster than if you start complaining about something or someone. Everyone is here to find solutions to the problem not to wallow in it. 3. No Judgements (Positive or Negative) – Negative judgements on someone’s contribution can shut down the individual – Positive Judgements create barriers that limit discussion. 4. Ideas are Seperate From Your Identity – Once you share it the idea belongs to the team you don’t need to defend it or make your idea better, the entire team can do that.
. So I’m listening to Jack Welch’s book Winning on tape. Part of the book’s chapter on Managing your Company stressed hiring the right people and specifically hiring people who know the rules. Presumeably people who understand the rules of their business are able to spot opportunities for pushing the business while still abiding by the letter and spirt of the law. But Jack’s words did not ring true until something I just saw a couple of days ago. In fact most Rule Mavens I know would rather beat you over the head with their knowledge of the rules then look for ways to push the boundaries of the business within them. On Friday I saw a link to a great story, it was about a couple of high school football coaches in California that spent the better part of 3 years developing a completely new offensive strategy called the A-11Offense. This new offense is so revolutionary that the coaches weren’t completely sure it was legal. But they poured through the rule books and were confiedent that it was. To be sure they when meet with league officials and referees who agreed that the new offense scheme was both legal and revolutionary. Unlike traditional offenses which telegraph which players are eligible and which are not by the way they line up, the A-11 makes it appear as though everyone is a eligible receiver and now the defense doesn’t know who to cover. The base offense also includes two quarterbacks lined up in shotgun formation. They installed this offense in the spring of 07′ and ran it 40-60% of the time in the 07 Season. It took them a couple of games to work out the finer points, looking at the reaction of the opposing teams but then then ran off 7 consecutive wins. The coaches have been fielding questions from all of the country about their offense. They started a website http://www.a11offense.com where they document their offense and provide information and support to other teams interested in learning how to run this offense. Then it occurred to me this is the advantage of having players on YOUR team who understand the rules. They can rethink how we do business and create completely new ways to be more efficient and profitable. Helping us to be as successful as the Piedmont Highlanders of Piedmont, CA.